I realize that this handwritten recipe is very hard to read so I’ve typed it out down below. It’s a classic case of Mum writing two recipes on the one piece of paper and the ink blurring through making both recipes really hard to decipher. The recipe itself sounds quite good, if you like apricots that is. Cook rice, then mix with coconut. Place in buttered pie dish. Mix nectar, water, sugar and boil, remove from heat. Beat egg yolks with vanilla, stir into nectar mixture with rind, pour over rice & coconut. Place dish in tray of water. Bake in mod oven 180o for 45 mins. Cool. Then spread with apricot jam, beat egg whites with castor sugar till stiff, spread on top. Bake further 10-15 mins. 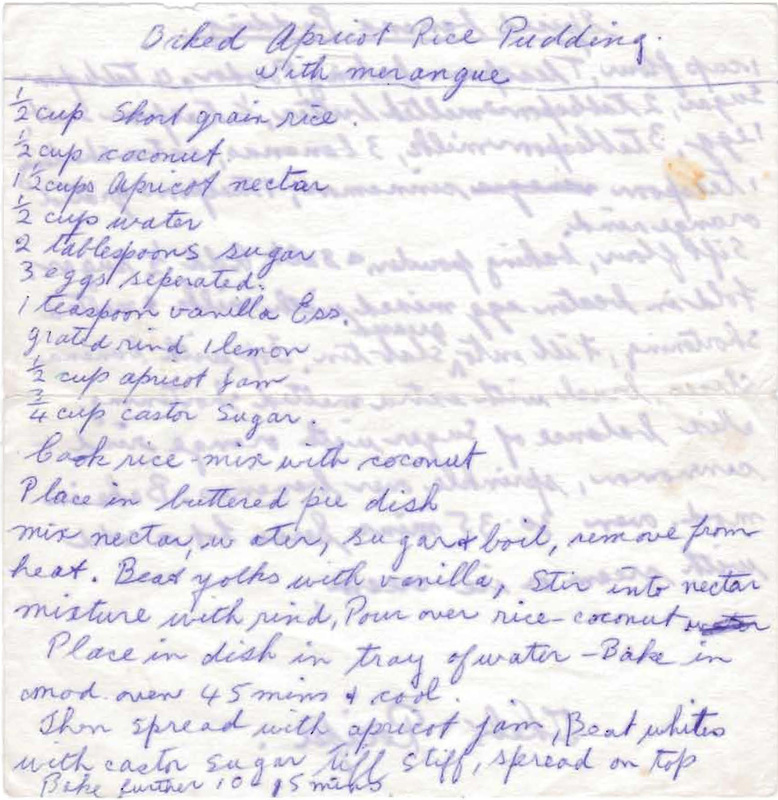 This entry was posted in All Recipes, Desserts and tagged 1960s, apricot jam, apricot nectar, apricot rice pudding with merangue, coconut, merangue, rice by bebsrecipes. Bookmark the permalink.